Tracheal collapse occurs most often in middle-aged to older dogs. The diagnosis is suggested by a honking cough precipitated by activity, excitement or water drinking. Nonproductive coughing may occur without a stimulus. Tracheal collapse results when the windpipe (tracheal) cartilages soften. The trachea should resemble a relatively firm garden hose. Viewed on end, the windpipe is a U-shaped structure with a tight membrane covering the top. Where cartilage softens, it collapses and widens at the top. The membrane then drapes (collapses) loosely, blocking the inside of the trachea. Depending on where the collapse is most severe, this results in an inability to bring air into or out of the trachea and lungs during breathing. Complications of this disease include lung problems, heart disease or heart failure, enlarged liver and chronic kidney insufficiency. Dental infections, elongated soft palate, pneumonia, chronic bronchitis and obesity aggravate the disease. Signs vary and include mild to severe panting, respiratory distress and bluish discoloration of the mucous membranes (cyanosis). Abdominal breathing efforts result in tense abdominal muscles. 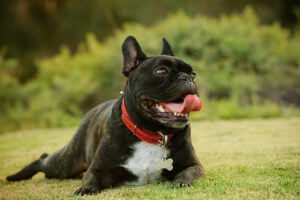 Dogs with tracheal collapse are frequently overweight but may be thin. A heart murmur associated with valvular heart disease is often encountered because both problems occur in aging dogs. The diagnosis of tracheal collapse, initially historical, is substantiated when a veterinarian can cause your pet to cough by mild digital manipulation of the neck. Neck and chest radiographs (X-rays) identify changes in the trachea during the breathing cycle (inspiration, expiration or both). The diagnostic evaluation may also include laboratory sampling of the blood to identify causal or complicating medical problems, motion studies (fluoroscopy) of the trachea and lungs during respiration, endoscopic examination of the windpipe and throat, and ultrasound evaluation of abdominal organ enlargement. Treatment of tracheal collapse has four components. During the acute phase, respiratory distress and severe bouts of coughing are ameliorated with drugs that relax the trachea and lungs and sedate the pet. Fluid congestion of the lungs due to heart failure (if present) is relieved with diuretic drugs and other cardiac medications. Short-term anti-inflammatory agents may be required to minimize swelling and tissue irritation within the trachea. Antibiotics are utilized if an infection is present. 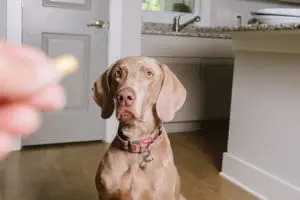 Cough suppressants temporarily relieve discomfort and those with narcotic derivatives may be used in a lifelong schedule for some pets with collapsing trachea. Later, drugs that relieve bronchial constriction and spasm may be utilized along with products to reduce anxiety and overstimulation. Anti-cough medications are used orally as necessary. Corticosteroid anti- inflammatory drugs may be helpful during episodes of acute exacerbation of the coughing. Problems requiring simultaneous medical care that compromise the tracheal syndrome include recurrent pulmonary or pharyngeal infections, dental disease and swelling of lymph tissue in the pharynx and tracheal region. Weight control is extremely important. Liver enlargement, secondary to fatty infiltration or other disease, adversely affects the outcome of this disease. Many smaller dogs are simultaneously affected with heart disease. Your veterinarian understands how these conditions interact. Diagnosing and treating both may significantly improve the long-term prognosis. If medical therapy has failed, additional procedures may be indicated to provide relief to dogs with tracheal collapse. Surgical correction of a tracheal collapse may be considered in young dogs when the trachea is collapsed in the neck region. 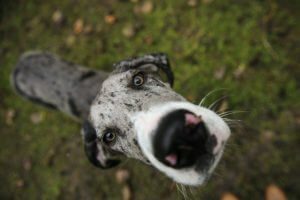 Older dogs, those with complicating medical problems, and those with most of the trachea affected are not good candidates for surgery. A tracheal stent may be recommended if the collapse involves the entire trachea or the region of the trachea within the chest. Side effects of tracheal stents include stent fracture, migration and growth of granulation tissue through the stent. Tracheal stents are placed using fluoroscopy, and do not require a surgical incision. The prognosis remains good for many pets with tracheal collapse identified early in the development of the disease. Occasional bouts of cough should be expected. Weight control is essential as obesity greatly worsens the long-term outlook in all patients with tracheal collapse. Concurrent problems that may add stress to breathing, such as elongated soft palate, must be corrected to slow progression of the disease. With severe tracheal collapse, the condition can become a serious, life-threatening problem complicated by spells of severe respiratory distress. Bouts of severe coughing and respiratory distress negatively affect the prognosis. The client should be aware of the frustrating limitations of therapy for dogs with tracheal collapse. Even with aggressive medical or surgical management, coughing is likely to continue to some degree, so therapy is aimed at maintaining a good quality of life, rather than eliminating the cough completely. Many dogs with tracheal collapse typically remain exercise intolerant for life and most continue to have coughing episodes with excitement.